I was truly surprised when I heard that on August 28th 2012 the Japanese Ministry of Environment had officially declared the Japanese River Otter extinct. No, it was not the extinction itself that took me aback- there had been no verified sightings of the adorable creature since 1979 and I , along with so many others interested in Japanese fauna, had long resigned myself to the worst. It was the fact that after 33 years of putting it off (and wishfull thinking- which is always good form in Japan) the government had finally admitted that a mammal which had survived into the Showa Period (1926-1989) had been allowed, under their charge, to disappear from the planet forever ( two species of native wolf had gone extinct in the Meiji Period, 1868-1912). Of course, I wondered- Why all of a sudden? Naturally the topic of Japanese sea otters does not crop up in conversation very often. 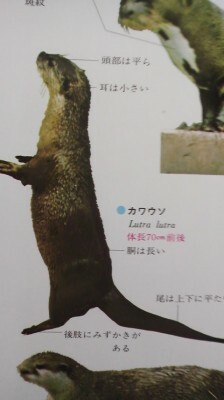 So another thing that added to my surprise, and actually made my jaw drop when I heard the news was the fact that a few days earlier, 85 year old Yoshida-San, a resident of Hitana, Tsuchiura ( near Tsukuba) had related an old folktale to me which attested to the fact that Japanese River Otters (Lutra lutra nippon) once thrived in this area- as they did throughout much of Japan`s main islands up until the Meiji Restoration of 1868 and Japan`s subsequent Westernization, modernization and industrialization. So for me, the timing of the announcement was not only puzzling- it was also a big coincidence- and I will retell the story I was told later on in this post. As I have just mentioned the Nihon Kawa Uso was long a common presence in Japan`s rivers, streams, lakes and ponds and along its coasts. Even in the great city of Edo ( now Tokyo) which had a population of a million people, there are records of plentiful river otters having lived in its abundant canal and waterways ( Edo had lots of intersting wildlife- seals in Edo Bay, storks on its temple rooftops, and cranes and ibis in the outlying farmland). It is possible that these playfull denizens of Japanese waters were the inspiration for one of Japan`s most popular fictional creatures- the KAPPA, or water sprite. But whether that is true or not, the fact is that the pre-modernized Japanese gave the river otters a certain amount of respect a living creatures with a soul. It was only after the onset of modernization, industrializtion, and westernization ( which went into high gear in the 1870`s) that these animal came to be seen as mere resources for humans to exploit for profit ( though for many hunters it was merely survival). The chances that took place in Japan at that time spelled doom for the river otters. Within 100 years they would be extinct. One characteristic of the Nihon kawa uso which helped to seal its fate was its fine fur. The fact that they lives in rivers and ponds meant that not only were the plets warm, but quite water-resistant as well. The skins become valuable commodities when trade with foreign countries was liberalized and extremely popular with Japanese settlers and soldiers who went to live in cold Manchuria. 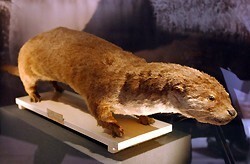 River otters were hunted and trapped vigorously with thousands upon thousands taken in the first years of the 20th century. But it was not only this widespread hunting which the otters faced- it was large-scale habitat destruction and pollution, as well. River banks were covered in concrete, marshes filled in, while pesticides and other pollutants killed the various creatures which the otters fed on. Fishing nets and cars also took their toll on the unfortunate animals. Since that time there have been many reports of river otter sightings by citizens- almost all of these turned out to be false leads- though in 1992 researchers confirmed that some hairs did in fact come from river otters. Extensive professional surveys, however, have always come up blank in terms of finding any more evidence of river otter presence ( though even after the official extinction announcement of August 28th the Ministry of Environment was flooded with calls by citizens who claim to have seen Japanese Rver Otters- this according to a friend of mine in the ministry!). There are still even some wildlife specilists who have faith that live Japanese river otters will be found. As I have said before, there is always a lot of wishfull thinking in Japan, and I do hope that these die-hard believers are correct! Anyway, here is the folk-tale told to me by Yoshida-San, who was born in what is now Tsukuba-City Sasaki, but now lives just over the Tsuchiura City border, in Hitana. Long, long ago a man named Genzo lived in the tiny hamlet of Tsukiji ( in what is now Tsuchiura City). Genzo was a money-lender specializing in lending cash to the local farmers who were required, under the terms of the loans to return the money in small DAILY installments. Since the farmers would usually come with their payments after the days work, Genzo never really went out after dark, and was unaccustomed to walking outside at night. One day, however, Genzo had some impotant business to attend to in the hamlet of Mushikake (also now part of Tsuchiura City). There he met an old acquintance and the two of them lost themselves in reminiscences and other conversation. Before they knew it, it was pitch black outside. ” Dark already”, exclaimed Genzo. “I had better be going home”! He set out on his way. Not used to walking in the dark, Genzo thought that the best way to find his way back home would be to walk along the bank of the Nosaiji- River ( which flows into the Sakura River).. It was more than a bit scary to be walking alone at night. There was no one else in sight, Or at least that is what he had thought. But suddenly he made out the figure of someone by the river. The person was not walking along, but standing and facing the river. “Its a woman standing all alone out here at night”, he muttered to himself . Approaching the figure, heart beating with anticipation, almost near enough to get a look when…….SPALSH! She disappeared into the river! “WHOA! What the…….” Surprised, Genzo rushed down to the shore of the river and peered into the water. Nothing. Not even a ripple. Genzo thought that what had happened was so strange that he evn suspected that he had been tricked by a fox. When he got home he wanted to tell someone about what had happened but he resisted thinking that no one would believe hin anyway. But one day, some time later, Genzo finally confessed to a friend. He described what he had seen, an elegantly slim woman with beautiful sloping shoulders looking out toward the river who disappeared suddenly into the water with a splash. Having listened to Genzo`s tale, the friend turned to him and said-” that wasn`t a woman, it was a river otter! 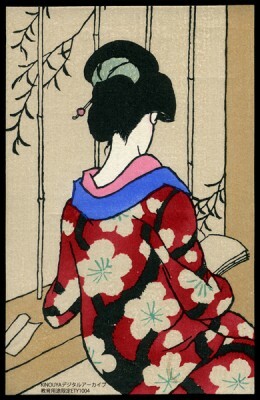 * Sloping shoulders (nade gata, in Japanese), shoulders which are shaped somewhat like a gentle upside-down Y were traditionally considered beautiful by the Japanese and especially suitable for those wearing kimono. Several occasions I have encountered them, cute! reminded my naughty dog. 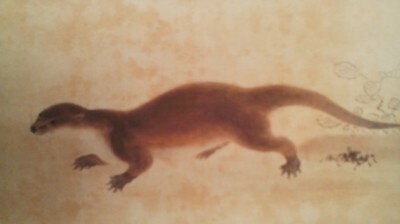 Avi-san taught me the Nippon Kawauso (Japanese river otter) I thought I have seen might be Itachi (Weasel)!! There is so called Kawawuso Keijiban(Otter board), many members said they thought they have seen Japanese river otters, but also mentioned those were probably Minks or Nutrias, Anyway they are hoping somewhere Japanese river otter are still playing with humans.